General Electric has launched a subsidiary to develop and sell the use of flying, crawling, and swimming drones for inspections in the oil and gas industry, among others, the company announced. 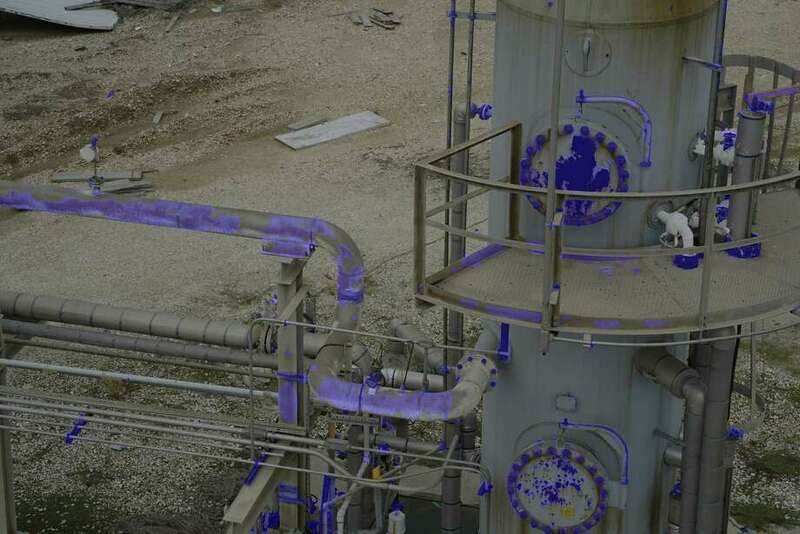 A photo of of oil and gas piping taken by a GE drone. The blue color represents corrosion detection. Credit: GE, Avitas Systems. The startup, Boston-based Avitas Systems, is already working with customers to test the drones on pipelines, gas flares, and holding tanks. “Now I can send a drone, on demand, and look at the length of the pipeline,” said Kishore Sundararajan, chief technology officer at GE Oil and Gas. He helped start Avitas. The oil and gas industry has regularly been upended by technology over the last decade. Breakthroughs in horizontal drilling and hydraulic fracturing brought on the shale revolution. The 3-year-old crash in oil prices drove oil and gas companies to lay off workers and rely on newer technologies such as remote monitoring, electronic drill-bit steering, and hydraulic fracturing advances to increase production and lower costs.